Prevents urinary infections in those at risk. Treats some forms of urinary infection, and helps prevent cardiovascular problems and gastric ulcers. 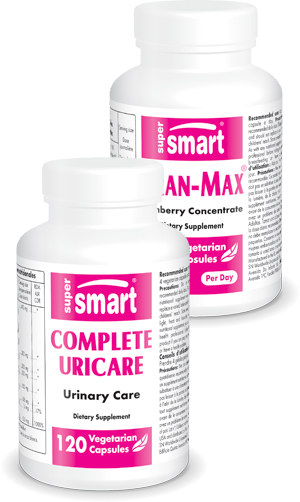 Targets all urinary symptoms (infections, incontinence, urinary urgency …). Contains Go-Less®, an innovative compound based on pumpkin seeds and supported by several clinical studies. Contains angelica for a healthy urogenital system and protection against external irritants. High in zinc, D-mannose and nurvala which helps to maintain good prostate health.